This so-called “magic belt” is the oldest of the few surviving examples of what was once a common phenomenon. It represents a gathering of powerful objects, largely Christian rather than pagan or magic, used to make a belt that would wrap and bind a child or other vulnerable person and protect him or her from the dangers of the world-whether demonic or the threat of disease or even death. Not an object that was made on commission in a workshop, this is an assemblage of familial amulets, treasures, and tools of prayer, sewn together on a cloth belt large enough (735 mm) to be worn by a small adult. Such wrapping or binding with a belt is an ancient gesture of protection of the vulnerable abdomen. This sort of belt, therefore, represents not only a collection of many things but also the bringing together of multiple rituals of faith, bodily care, and even devotional labor (one imagines a mother lovingly sewing a similar, perhaps less aristocratic belt). There is no doubt that this Castilian example is one of very high status (and primarily to be dated to the seventeenth century, although dates are difficult with such an agglomerative object). Its use of spolia, that is, significant reused objects, speaks to a family history of wealth and power. The fabric is a red velvet brocade, with discs of gold thread, of Islamic manufacture, specifically Mongol of the 14th century. To this fabric base is sewn a collection of twenty-eight silver coins, also mostly Islamic in origin. The assemblage of coins includes a majority from al-Andalus, one from the tenth century, and a group from the fourteenth century. To these were added two eighteenth-century Moroccan coins and a silver nineteenth-century medal, indicating the continuing work of adding to the belt. The re-purposing of these coins is emblematic of Christian victory, that is, specifically they “stand” for the Reconquista, the defeat of the rule of al-Andalus and winning back of Spain for Christianity in 1492. In their inclusion on the belt, in effect, the coins depict Muslim culture as a client culture, contributing to Spanish trade and prosperity as well as to the power of this object, but subject to Christian control. Other treasures attached to the belt are also reused but are contemporary and Christian. Originally gifted to the Virgin in the Church of Herrera de Pisuerga (Palencia) in 1945; then Madrid, Subastas Segre, 2005, no. 4; private European collection. So-called magic belts, also known as “Virgin belts,” were often presented to a venerated image of the Virgin as votive offerings. 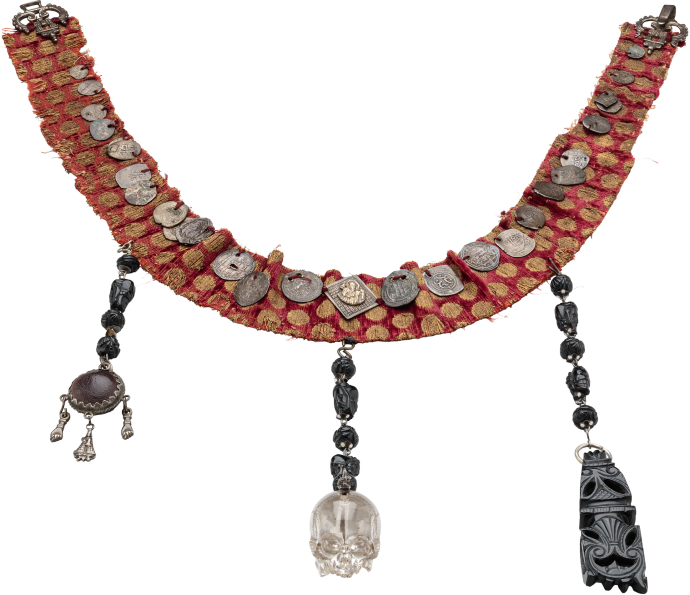 Others were worn and adapted—like this one—to include personal amulets of the owner. For a magical belt of the seventeenth century, cf. an example in the Museo Sorolla, Madrid (exh. cat., La Joyería Española 1998, no. 12, described as a belt for lactation). For a similar rosary, see an example in the Museo Nacional de Artes Decorativas, Madrid (Franco Mata 2005, fig. 34). The tropical nut known as castaña de Indias is an amulet worn by children, also popular in South America; cf. a seventeenth-century example in the Bayerisches Nationalmuseum, Munich (Hansmann and Kriss-Rettenbeck 1999, p. 109, fig. 120). See further examples in the Museo del Pueblo Español, Madrid (Alarcon Roman 1987, p. 61, no. 1.917; p. 70, no. 3.044, p. 98, no. 9.884) and in the Museo Diocesano de Cuenca (Gonzalez 2005, pp. 22, 30, and 85 including a painting of 1673 by Baltasar Manuel Blanco Bernal, in which a nut is worn on a belt by a child). Rock crystal skulls were attached to rosaries; see an example in the Metropolitan Museum of Art, New York (inv. no. 17.190.323) and the Museo Lázaro Galdiano, Madrid (Arbeteta Mira 2003, no. 15). The figa (higa in Spanish), was a popular amulet in Spain, where they were often made of jet; see various examples in the Museo del Pueblo Español, Madrid (Alarcon Roman 1987, p. 68, no. 2.551; p. 79, no. 7376); Franco 2001, pp. 210-23; Subasta de Amuletos y Joyas Populares 2005, pp. 52-53. Other seventeenth-century examples are in the Museo Archeológico Nacional, Madrid (Franco Mata 1986, figs. 33-36, figs. 37-38 and figs. 39-41); Hispanic Society of America, New York (Proske 1966, fig. 4) and Muller 1987, fig. 6.18). The velvet with gold discs is of Islamic origin. An identical textile fragment in the Cleveland Museum of Art (Dudley P. Allan Fund 1918.225) is from Iran and dates to the late 1200s, thought to be from Tabriz during the Ilkhanid Period; an inventory of Pope Benedict VIII dated to 1295 describes such a velvet. This velvet design belongs to the earliest known type.